This post tells the story of how Shopit (ecommerce platform) started, evolved and my sad farewell to a great product. It was mid-2009, and there were only a handful of shopping carts out there that offered some form of flexibility. Shopify was still in its infancy and didn't have most of the features it has now. I was given a month to get things moving, with a set launch date in the summer. Thankfully, I had used a PHP framework called CodeIgniter a few months prior, so I decided to use it again to speed up the development of my ecommerce platform. I worked long days and weekends to get the system all ready for launch. 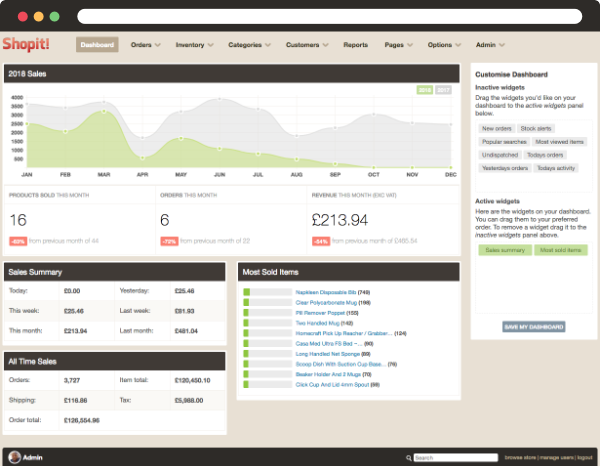 It was a basic ecommerce platform, but it had the main features that were required. Launch day was successful, and orders started coming in. The first version was called Dubbed Commerce (later shortened to dcommerce - not ecommerce! ), aptly named after my then business Dubbed Creative. But, me being me, I wanted to give the client something better, something that would help improve their business and help them to gain momentum. So, I began to work on the second version. By this time, I wasn't working alone but had employed Steve, a web designer with great design and coding skills. Version 2 was released six months later, and I upgraded my client's store for free to test it out. I still remember the thanks I got for it, they were so pleased with it. I felt great, I couldn't stop adding features! And so the Shopit ecommerce platform was born, and there were many updates on it for the next five to six years. Version 2 grew to 3.2.6. It started to gain some momentum with new clients signing up to use it, from locker manufacturers to a London music store selling vinyl and downloads. Clients all had a say in what features were added, and Shopit was very much a client-driven software. Shopit became a solution to everyday ecommerce problems, and that was its unique selling point. Snippets, enabling easy editing of website areas. These were later updated to allow for dynamic data such as pulling the latest post from a Wordpress blog. They could also be nested within each other! 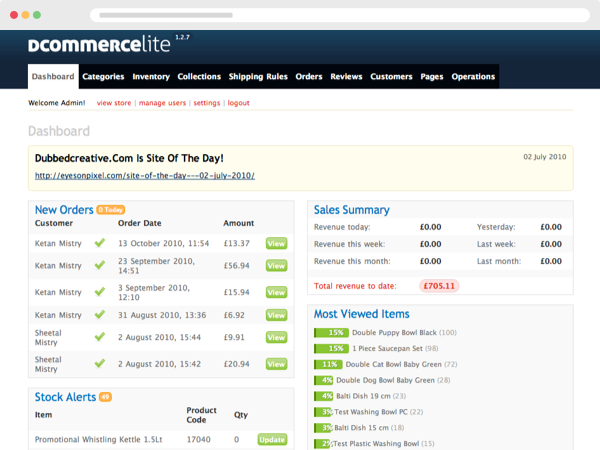 An admin bar which appeared on the storefront and allowed easy access to editing products, snippets and store information. Product conversion reports displaying how many users added the item to the basket, whether they proceeded through the checkout and what other items they purchased with it. The report also showed a monthly chart of when the article was bought in the event there was a seasonal trend. Cross-sell groups allowed for more advanced customisation on the store-front. Although a simple feature, it allowed the developer to get creative with it. But, since 2014, version 3 was no longer maintained as I had started working on a cloud-based enterprise version of it ( i.e. a hosted solution, like Shopify). For two years I was the only developer working on it, and working ridiculous hours (16 per day!) due to deadlines, it became too stressful a task, and I resigned from my position in January 2018. At the time I was Director at Project Octo, a Manchester "design agency", although we didn't do much design and never really launched an actual website for two years, which was a very frustrating period. During this time, the rights to Shopit were handed over to Project Octo/Shopit Commerce Ltd with the intention that it could grow into a successful cloud-hosted platform making lots of money. Version 3 was sadly open sourced at the same time and put to its death, and at this time, the git repository is no longer available online. The idea behind Shopit Cloud was to allow businesses to signup online, and an ecommerce instance (a MySQL database) would be created for them, giving them access to a full featured admin and a set of APIs to build their own storefront. A very cool idea. Looking back, I'm glad I stepped away from the development of Shopit Cloud. Time constraints forced me to develop and build the application using what I was familiar with (mainly PHP with a mix of Python) rather than looking at newer, more capable technologies that were suited to the high load requirements of an ecommerce platform. As a result, I believe the application's structure isn't capable of handling a high amount of load even though it is running on Google's App Engine and CloudSQL (MySQL) technologies. I like PHP, but I don't think it was suitable for this application, and I made the wrong call. When I left in January 2018, it was still in alpha and hadn't really been tested and therefore was full of bugs. I'm a big fan of Google's Cloud Platform, even this website runs off a Compute Engine instance. It's easy to set up and is relatively inexpensive, but for Shopit Cloud, CloudSQL will be the killer. As more databases are created, more resources will be required, and the cost will inevitably rise significantly. CloudSQL is expensive. On top of this, data needs to be backed up; thus storage costs go up too. And with MySQL being notorious for crashes, backups are essential. Even today, I try to avoid CloudSQL. At the time of writing, I believe Shopit Cloud is still loosely in development, but I no longer keep up to date with its progress. In my opinion, a system as large as this requires a team of good quality developers behind it who can improve, rebuild and support it. Support I could only dream of. But personally, building Shopit from version 1 to the cloud was a valuable experience. I learned how to plan and develop a product including feature sprints, version releases and maintenance. It's pleasing to know that a handful of clients are still using a version of it and are happy with it. Would I build Shopit all over again? Nope, ecommerce is a business that requires stability and a reliable foundation. It's best left to the big companies who can support business growth and have the infrastructure and team to do so. RIP Shopit old friend, we had a great ride.